The popular Anno series has survived for over a decade now, each title being numbered in such a way that makes you wonder if they form some kind of sequence test. There is only so much you can do with wooden ships and colonial-era economies, and instead of going for an Anno 1805 or Anno 1299 the franchise has finally made the jump to the future. Mankind has messed up the planet's ecosystem leading to a dramatic rise in sea levels, forcing civilization to spread across somehow uninhabited islands that act as the colonies of old. Two new and completely different factions -- the ecology-minded Eden Initiative and the industrialist Global Trust -- now vie for control of the remants of civilization, and it is up to you to keep trying to create the perfect archipelago empire until the birds start chirping and you notice the sun has started to rise. Yep, it's still an Anno game alright. The traditional Anno formula is still intact in the year 2070 and once again you are tasked with balancing an ever expanding economy across multiple islands with the financial burden of keeping everything running. The industry side of your economy will be familiar to most: harvest raw materials for industry buildings that create the goods you need in order to grow your population and support higher levels of industry. Construction of buildings costs goods you can produce yourself, but it also often costs money -- something you primarily gain by taxing your population and by trading with other powers on the map. 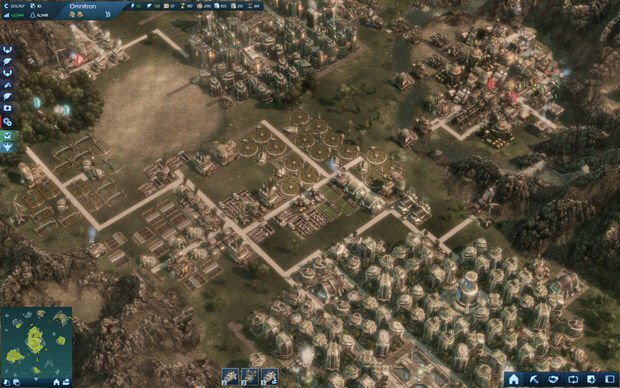 Expanding your population in Anno 2070 is of paramount importance to stay in the black, but building large residential areas shares more similarities with the Caesar games than, say, Sim City. Instead of building wildly across a huge map, you tend to slowly fill up islands with separate industrial and residential areas. Residences require two things to advance in 'level': goods your economy can produce and services that are projected in a radius by special buildings. As you satisfy your population's needs, residences will advance to house more workers and the workers that live there will advance in skill level and pay more taxes. Each skill level your workforce attains gives you new needs to satisfy before they can advance again, and each level you gain access to new buildings for your economy. This leads to a slowly paced but very enjoyable cycle of growing your economy and advancing your workforce to grow your economy some more. 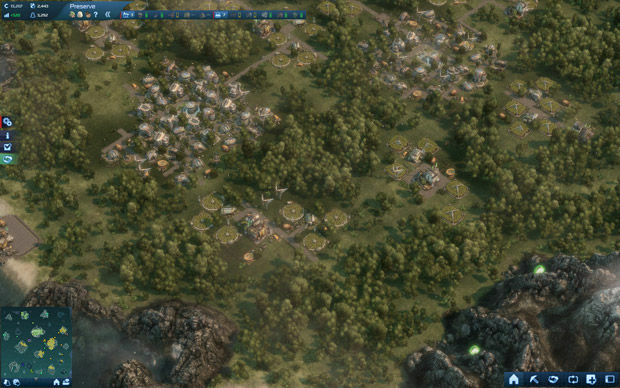 Compared to similar games like The Settlers or Caesar where resource transportation can eat up a lot of time, Anno 2070's economy features storage buildings that magically and instantly share all resources with every other storage building across an island, removing the need to transport resources from one place to the other. Industry buildings don't need workers to function, so it becomes a game of optimizing the available space on an island to produce the most efficient residential areas while you build your industry wherever it fits best. Not every island has access to all types of resources or has the soil to support all types of farmland, though. As your population grows and advances, you'll inevitably need to expand to other islands that provide the resources you need to keep advancing your little island civilization. If you are missing a 'fertility' that allows you to grow a certain crop, you can buy or research an item and seed your island to support that crop, but this is usually more of a mid-to-late game option. Eventually the island-spanning economy becomes gigantic in size and it can take some getting used to if you haven't played an Anno game in a while, or if you are new to the series. Thankfully the campaign does a good job at very slowly easing you into all the aspects of the basic economy, advancing your population levels, and moving from your initial island to a nation that dominates the seas in both trade and maritime power. Central to the post-global warming era are the two main factions: the Eden Initiative (the Ecos) and the Global Trust (the Tycoons). Each faction has a wildly different economy and both require a slightly different play style. The Eden Initiative gets more eco-friendly buildings, but they are highly reliant on farms that suffer under ecological stress. The Global Trust on the other hand is all about highly polluting industry, but they are not as reliant on farming as the Ecos. 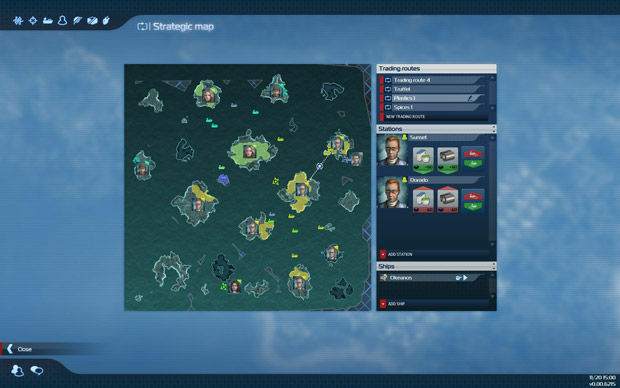 The global warming theme being central to Anno 2070 offers a new gameplay element, the ecology of your islands, that affects production and mood. Ecology is negatively affected by farms and industry, but you need both of these for the sake of progress. This can be unfortunate for the Eco faction since their population becomes less happy as pollution increases, although the Tycoon population doesn't care if it lives under a layer of smog. Because both factions do benefit from paying attention to your 'ecobalance' rating at the farming level, they have their own solutions for removing pollution. The Ecos have pollution-free power generation instead of the Tycoon's coal power plant alternative, and they can spread weather control stations all over an island to reduce pollution. The Tycoons have waste recycling centers that reduce more pollution if they are surrounded by more houses, but this takes up precious room around your city centers where otherwise people could've lived to provide you with more tax income. Other high level ecology-boosting buildings unlock down the line, but at a very high cost. As a result, the Ecos tend to end up with a more balanced ecology due to the types of buildings they require, while the Tycoons tend to make ecology something that is more of a bother than a goal -- you can often put those affected farms on another, cleaner island, after all. This difference is reflected in the visual style of an island. Not only do the Ecos have 'green' buildings that blends right into a forest, but their ecologically flourishing islands are basked in sunlight and have nice warm bloom-y glow. The Tycoons on the other hand end up with the type of cities you know from dystopian movies like Blade Runner and their polluted islands are grim and dark environments. Unfortunately the ecology of your islands doesn't really affect the gameplay that much other than acting as a production and mood modifier; don't expect to lose coastal ground to a further rise in sea levels if you mess up the world some more. There is a global eco rating for all combined players, but it doesn't seem to affect anything for the moment. A third faction, the S.A.A.T., is a Tech faction that allows you to research upgrades for your island's economy and ecosystem, your Ark (a floating base that acts as a flagship), and your naval units. During the campaign you'll get some playtime with them, but they are primarily a separate research faction that you can unlock during the game's single missions and its continuous play sandbox mode. Using the S.A.A.T. isn't as simple as just constructing their buildings so you can research upgrades, though. Research requires you to essentially create an entirely separate city and matching economy for the Tech workforce to unlock the high level fruits. Of course, this Tech workforce requires completely different goods than the Ecos and Tycoons, effectively forcing you to manage two different factions at the same time. This can get a little ridiculous and you'd do well to get your primary faction's economy up and running first. While the Ecos and Tycoons both require food and drink that is relatively manageable to supply, the S.A.A.T. researchers drink energy drinks at a completely unhealthy rate. The energy drink economy takes up a lot of valuable space which can require some careful planning if you want to place both factions' residences and basic economies on the same island. Among the Tech faction's and other faction needs are resources that can only be harvested on the ocean floor. 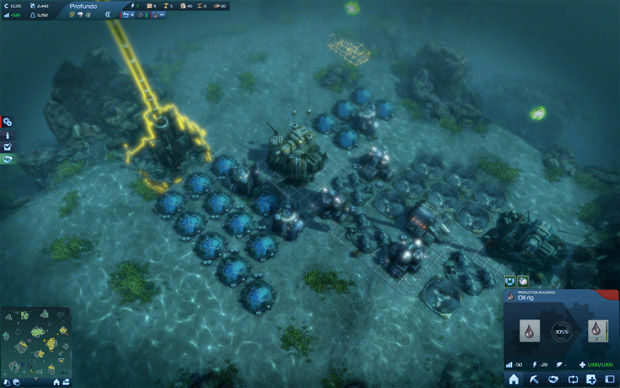 Anno 2070 expands upon the old formula by adding underwater plateaus for base building, but don't expect to create massive underwater cities; underwater bases are little more than cool resource colonies that are a fun visual distraction with no meaningful impact on the gameplay. The game's campaign mode acts like a long tutorial for the first two of three chapters, and initially you might be worried that there isn't all that much to it because it is pretty easy to blast through. By the time you get to the third chapter, however, you have to learn the hard way how to manage your finances and how to keep oversight of dozens of production chains simultaneously. There is a story that ties the three factions together in a way that lets you get the hang of all of them, sometimes requiring you to manage all three at the same time, but the campaign only lets you scratch the surface of Anno 2070's endgame. The meat of the game that will have you playing Anno 2070 for days on end is found in the sandbox mode and a handful of single missions. The latter are scenarios with preset goals where you have free reign to choose which faction to start with and a huge map to claim as your own. It is here that you finally go from one ship to an armada, from one dockside warehouse to numerous cities, and a mindboggling deep economy. Other factions occupy the same map and you can trade with them, declare war on them, use some basic diplomacy, and do quests. These quests shape the campaign missions as well, usually simply requiring you to bring thing A to place B or scanning an object with a unit, but in the more free-form single mission and sandbox modes they also offer Influence Points and other rewards. Influence Points can be traded for special upgrades items, sometimes providing you with a shortcut to something would've had to research. 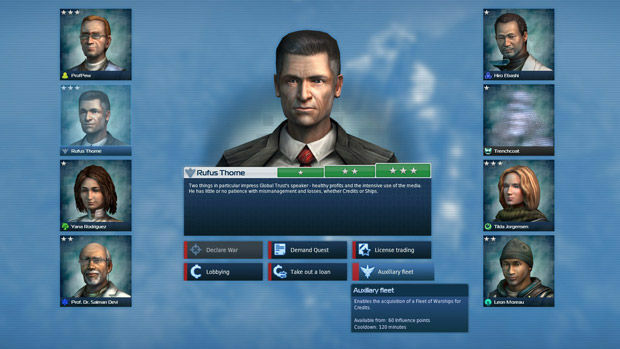 Play one of these scenarios the right way, and you can even end up with access to all three factions' production trees if your mind can handle managing them all at the same time. If all of this sounds like a lot of work and too many aspects to keep track of, it is a lot of work and it can be hard to keep track of it all. Yet somehow Anno 2070 pulls it off to offer the freedom of multiple paths to success for diverse economies and play styles in a way that never feels restrictive. The UI with its building tabs for every level of your population can take a bit of getting used to, especially when a building that constructs the same type of goods is found in different tabs for different factions, and here and there the odd German description for a building or good will pop up. The game also doesn't explain some small aspects as well as it could, but when there are so many of them to cover this is bound to happen. After a day or so of playtime, everything will become second nature and what minor issues there are become of little importance. You will need a Uplay account to login and play Anno 2070, and it requires online activation and all that jazz, but disconnecting your internet in-game doesn't hamper the gameplay, thankfully. 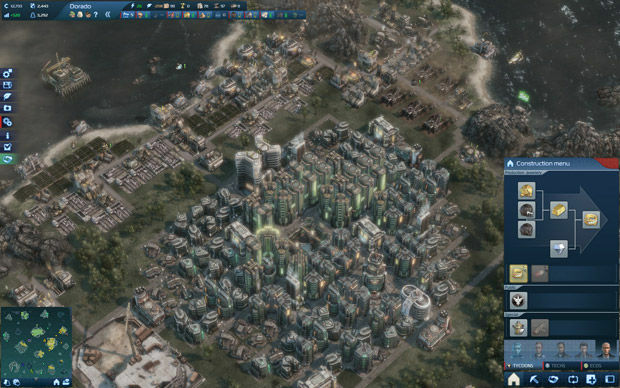 The only major downside you'll find in Anno 2070 is the amount of time it will consume. You can pretty much forget about doing anything productive until you grudgingly drag yourself to bed once you start a sandbox game or single mission scenario -- which can easily last for days -- and an accessible multiplayer system with chat functionality and friends lists is there for whoever wants to build cooperatively, or raid the seas competitively. Story-hungry players might feel unfulfilled by the campaign, but Anno 2070's mechanics provide enough food that their bellies will be bloated by the time they move on to another game. 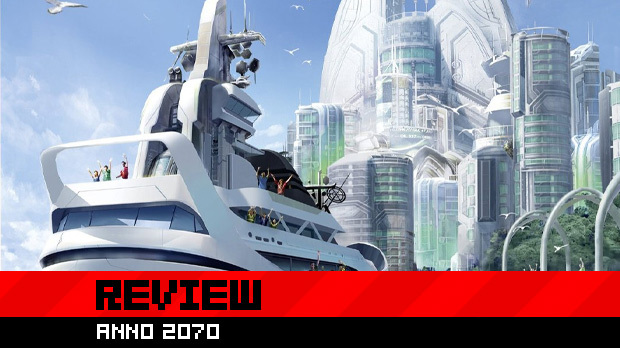 While it may bewilder players new to the genre with the sheer complexity of it all, Anno 2070 succeeds at giving the decade-old series a fantastic makeover. Fans of the franchise will feel right at home as the formula hasn't changed all that much, but the myriad additions and improvements have been expertly crafted to fit right into the core gameplay. Moreover, it manages to do what A Nightmare on Elm Street may have done to you as a child: you won't want to go to sleep and when you do, you'll dream of even more efficient island layouts to try out the next day.